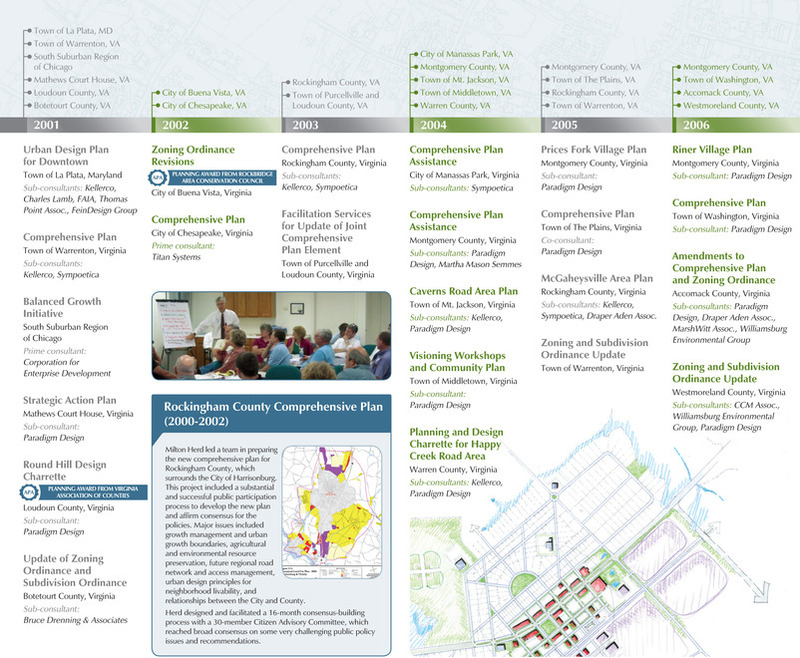 Herd Planning & Design, Ltd. provides collaborative community planning and design services for local governments, community organizations, and landowners, throughout Virginia and the mid-Atlantic region. Milton J. Herd, FAICP, founded the firm in 1991. It is based in Leesburg, Virginia, and specializes in Comprehensive Plans, Master Plans, Zoning Ordinances, Consensus-Building and Visioning and Strategic Planning. 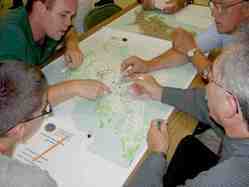 It also provides special research, analysis, and expert testimony on land use matters. The firm's mission is to help communities successfully manage change through the creation and implementation of plans for the future development and conservation of land resources - plans that are effective, meet the needs of the community and enjoy broad public approval. The firm is known for providing high-quality, personal, cost-effective, reliable, and creative professional planning services. County of Loudoun, VA - In May 2014, Milton Herd began facilitating a series of focus group sessions of County staff leaders from several departments of County government to prepare a Strategic Plan for the County's Environmental Programs. Gloucester County, VA - Herd Planning & Design, Ltd. completed a sub-area plan for the historic Courthouse Village area of Gloucester County, Virginia in 2013, and is currently engaged in preparing revisions to the County's Zoning Ordinance for the Courthouse Village and the Gloucester Point/Hayes areas. The project is a joint effort of the Gloucester Main Street Preservation Trust and the Gloucester Economic Development Authority, on behalf of the County and its citizens. 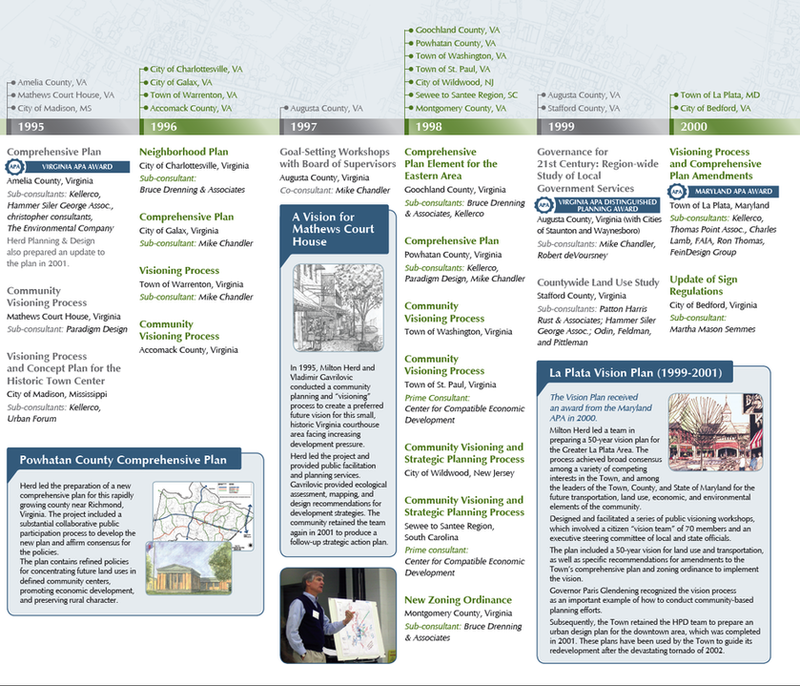 City of Fredericksburg, VA - In January 2014 Milton Herd facilitated a joint strategic work session of the City Council, Planning Commission, and Economic Development Authority to provide direction for updating the City's 2007 Comprehensive Plan. Clarke County, VA - Herd Planning & Design is currently leading a multi-discipline team, including S. Patz and Associates, in preparing a Strategic Plan​​​​ for Economic Development, as part of the County's Comprehensive Plan update. Town of Charlotte Court House, VA - Herd Planning & Design is a member of the team led by Placeworks​​ Collaborative, Inc., to prepare a Comprehensive Plan for the Town, and to revise it's Zoning Ordinance. 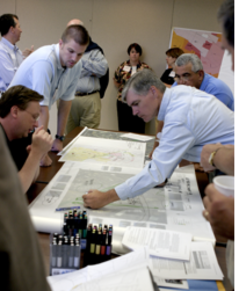 Charlotte County, VA - Herd Planning & Design is a member of the team led by Placeworks​​ Collaborative, Inc., to prepare revisions to the County's Zoning and Subdivision Ordinances. City of Manassas, VA - Herd Planning & Design is assisting The Berkley Group, LLC, to prepare revisions to the City's Zoning Ordinance. 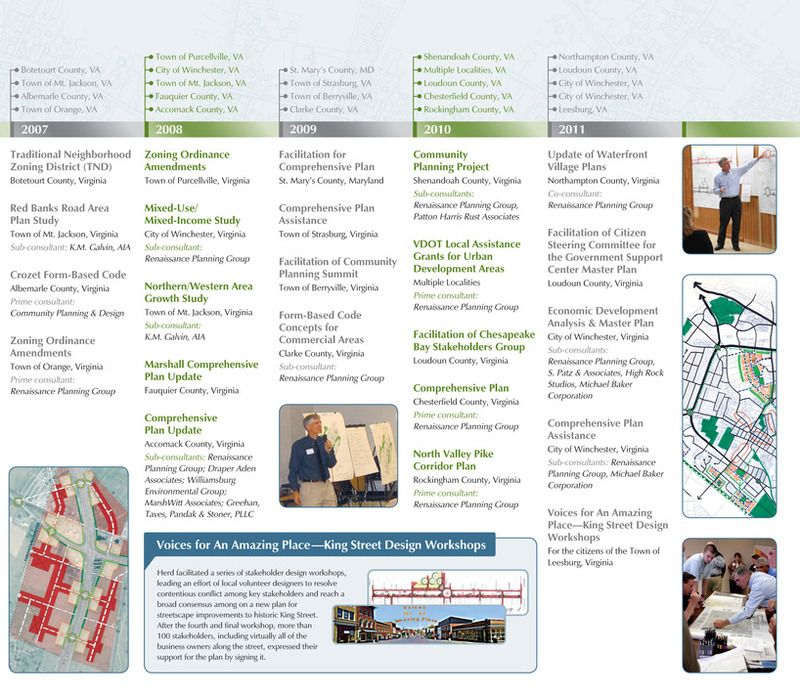 Front Royal, VA - Herd was a member of the team led by Renaissance Planning Group that conducted a collaborative visioning exercise as the foundation for updating of the Town's Comprehensive Plan in 2013. 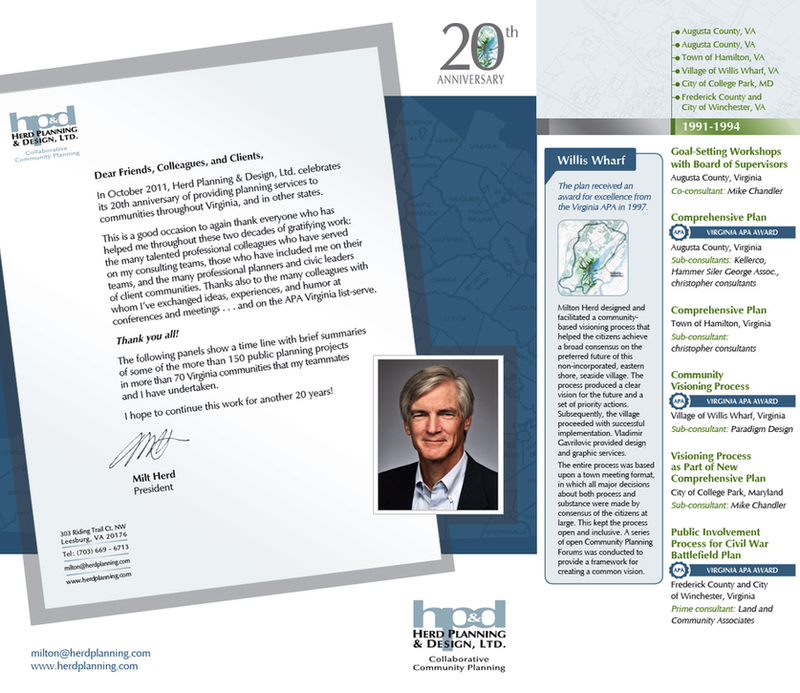 ​​​​​​​​​​In October 2011, Herd Planning & Design, Ltd. celebrated its 20-year anniversary! Thanks goes to all the friends, clients, and colleagues who have made this possible! SCROLL DOWN to view the time line of projects! Milton Herd Inducted into College of Fellows - On April 27, 2014, Milton Herd was inducted into the College of Fellows of the American Institute of Certified Planners (FAICP) at a ceremony in Atlanta, in conjunction with the National Conference of the American Planning Association. 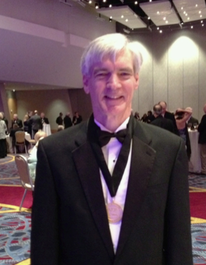 Being named a Fellow of AICP is one of the highest honors available to planners in America. Fellows are honored in recognition of their achievements as model planners who have made significant contributions to planning and society.